The New Mexico Cancer Plan serves as a blueprint for cancer control in our state. The Plan resulted from many hours of work and thoughtful contributions by the Cancer Plan revision ad hoc committee and the Executive Committee. In addition to updated goals and objectives, the revised Plan has new content and features including an appendix with evidence-based interventions to assist people in identifying and implementing interventions to address goals and objectives in the Plan. There is also a new section called, “Considerations for Implementing the New Mexico Cancer Plan in Native American Communities” which was created by the Native American workgroup. The newly revised Plan includes goals and numerous objectives and strategies that span a continuum of care encompassing prevention, early detection and screening, elimination of disparities, access to care, quality of life and effective coordination and collaboration among organizations that conduct cancer control and prevention programs. Strategies include, but are not limited to, promoting healthy lifestyle habits, detecting cancers at earlier stages, improving treatments, improving the prognosis and quality of life for cancer patients, and increasing access to health and social services. The Plan is intended to be a relevant, timely, user-friendly and valuable tool that can be used by a broad audience including public health practitioners, planners, advocates, educators, medical providers, and others involved in all areas of cancer control in New Mexico. Plan implementation will include local activities in communities across the state, collaborative efforts among small groups around specific areas of interest and statewide efforts. 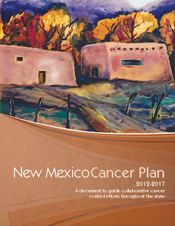 Click here for a downloadable PDF of the 2007-2011 New Mexico Cancer Plan. Click here for a downloadable PDF of the 2002-2006 NM Cancer Plan.